60 MP3s exerices that quiz you do singing notes against a blue progression. Do you feel that absorbing the blues unique tonality would help you understand the idiom? 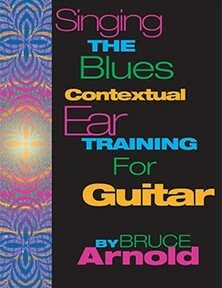 Do you want to express your feelings and the sounds you hear in your head through the blues progression? If the answer is yes then this course will help you to learn what all twelve notes sound like in a blues tonality and help you to HEAR the Blues and translate that into your SINGING. A Blues progression creates a unique tonal center. This “Blue” tonal center is heard everywhere in modern pop music and developing your ear to hear within this context is the key to being a great blues musician. and love in the blues. These simple but crucial exercises give you the path to really understanding and hearing the Blues in an organic way. You will cement your Blues understanding through the use of classic Organ Trio, Guitar Trio and Piano Trio. This will place you in a real bluesy situation and then prompt you to sing notes. Singing and hearing in a real musical environment is really the best way to improve BOTH your singing, and your playing. And there is no better way to develop this than with these direct application exercise expressed through these classic chord progressions. It is also recommended that you are getting about 50% correct notes with the “Ear Training One Note” exercises before attempting these singing exercises. All you need is just a few minutes a day singing through the exercises to reach the level of mastery you are aiming for. Develop your ability through this “Contextual” based ear mastery method and you will memorize the sound of the blues and develop of your ability to sing each note within this unique key center. chord progression is found in all 12 keys. You are prompted to sing a note then you will hear the right note played by a fat, Chicago style guitar sound to keep you in that bluesy spirit. Please note: this is not a “learn how to sing course” covering breath support, vocal technique etc… but an ear training method that requires you to sing pitches with a key center to improve your ear. Below are some examples of this one note ear training. This entry was posted in Ear Training and tagged ear training, blues, singing by Muse Eek. Bookmark the permalink.